Irfan Composing & Shadi Card Centre deals in composing & design work. 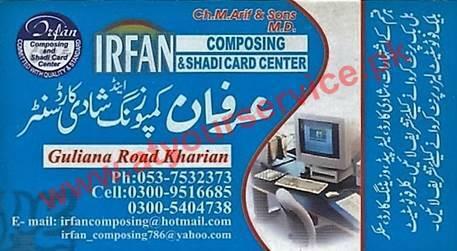 Irfan Composing & Shadi Card Centre is located in Raza Plaza, Gulyana Road, Kharian. It deals in all types of composing & design work, fancy shadi cards, CV writing, photocopy, color & black printout.